The ballistic missile test occurred in late April, according to a senior officer of in the Iranian military. Iran has successfully test-fired a precision-guided missile in April, the Deputy Chief of Staff of the Iranian Armed Forces, Brigadier General Ali Abdollahi, revealed at a conference in Tehran on Monday, according to Tasnim News Agency. “Two weeks ago, we test-fired a missile with a range of 2000 kilometers (1,242 miles) and a margin of error of eight meters,” Abdollahi said. “Eight meters means nothing, it means it’s without any error,” he explained. “We can guide this ballistic missile,” the general added. Abdollahi did not reveal details of the test and it is unclear where the launch occurred and what type of ballistic missile was involved. In March, the Iranian Revolutionary Guard Corps launched two Qadr ballistic missiles from a missile test site in the Alborz Mountains, a mountain range in northern Iran. 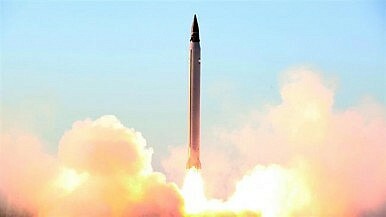 The medium-range ballistic missiles– one emblazoned with the phrase “Israel must be wiped out” in Hebrew–successfully hit targets on the Makran coastal strip along the Persian Gulf, in the southeast of the country. As I reported previously, Iran has the largest ballistic missile force in the Middle East with over 1,000 missiles in its arsenal. However, the majority of Tehran’s arsenal consists of variants of technologically outdated Soviet Scud missiles. “Some of the more dangerous missiles in Iran’s inventory are the solid-fueled Fateh-110, the liquid-fueled BM-25 medium-range ballistic missile (MRBM), and the still-under-development two-stage solid fueled Ashoura MRBM,” I explained. In October 2015, Iran purportedly test-fired a single-stage, liquid-propelled medium-range ballistic missile, the Emad (Pillar)–a variant of the Shahab-3 allegedly fitted with a maneuvering reentry vehicle (MRV) to improve the weapon’s accuracy. It is, however, highly unlikely that Iran has mastered MRV technology. Iran has not conducted extensive, realistic missile tests at full operational ranges and carried through to strikes on target with the same configuration of its modified or Iranian-produced missiles to make reliable estimates of their war fighting capability. As a consequence, Abdollahi’s announcement has to be put into context with exaggerated Iranian claims of successful missile tests in the past and should be met with a dose of skepticism, particularly since the recent test cannot be verified independently. Iran is preparing a major ballistic missile test in February 2017 involving the Simorgh space vehicle, an Iranian-made small-capacity orbital small carrier rocket. Iran’s defense minister disputes that a test-launch of a precision-guided missile with a 2,000 kilometer range occurred.